VBEBookmarks.dll is a COM Add-in for the Microsoft Office Visual Basic Editor which lets you bookmark up to five locations and have five copy buffers that you can use in your VBA projects. ToolsRefSize.dll is a COM Add-in for the Microsoft Office Visual Basic Editor which enlarges the Tools, References dialog box so you can see long paths. Note: If you are running Office 2013 read the information on the bottom of this page first. 1: Unzip the dll anywhere on your machine. Enter "cd C:\Add-ins" (without quotes) at the command prompt and press Enter. Enter "REGSVR32 NameDLLFile.dll" (without quotes) at the command prompt and press Enter. Make sure you start your Command Prompt with Administrator privileges. 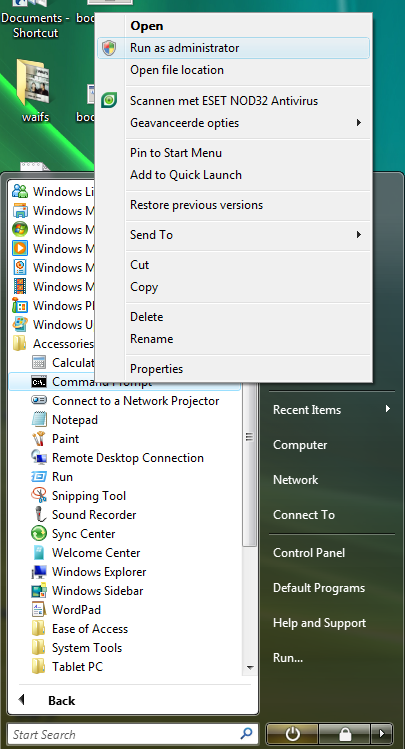 Right click the Command Prompt shortcut and click Run as Administrator. How do I use the Add-ins ? When you start your Office application and switch to the Visual Basic Editor the Bookmarks toolbar will appear automatically. If you don't like its location you can move it wherever you want and the add-in will try to remember that location for the future. The Bookmarks toolbar has five toolbuttons captioned "1" to "5" and a sixth toolbutton to reset or free up used toolbuttons. All toolbuttons are initially available and have the tooltip "Unused" when you mouseover them. When you find a place in a module you want to bookmark simply click an unused toolbutton. The toolbutton will appear "pressed" and its tooltip will change to the name of the parent Office document/workbook, etc., module and line number.To have a toolbutton that is already in use mark the current location instead hold the Shift key down when you click it. To return to this spot later simply click the same toolbutton. To reset all toolbuttons (mark them unused) click the R button. There are also five toolbuttons captioned "A" to "E" and a sixth toolbutton to clear the copy buffers. You can select a few code lines or a complete macro or function and click one of the Buttons to copy the code in the buffer of that button. If you click on the button again it will paste the code where the curser is on that moment. If you want to change the copy buffer for one of the buttons hold the Shift key when you click on it. You see that the tooltip of the button will change also when you do this. Note: Jim based this add-in on work previously done by Stephen Bullen in his VBE Tools v2.0 and thanks him for having made his code public. Use Add-Ins, Add-In Manager to control whether the add-in starts up automatically and to load and unload it manually. If you not want to use it anymore you can unregister the dll like I also show you on this page. This is required in order for VB6 COM add-ins that use the COM Add-In designer to work. It was installed by all previous versions of Office but not Office 2013. You can copy it from an Office 2010 computer if you don't find it on your Office 2013 machine, than you need to register it like I show you above. You can also download the 2010 dll file from my site if you want so you can copy it to your 2013 machine.